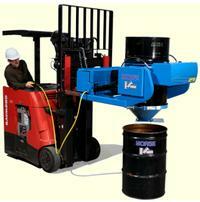 Lift a drum off the floor, a pallet, racking, trucks, etc. Use the new Morse model # MO-290F GRIP+GOTM power-grip fork mount drum handler to lift, move and pour a drum right from your forklift. You can FULLY invert a drum . . . turning the drum forward 180 degrees. Control the drum tilt function all the way from upright to fully inverted. 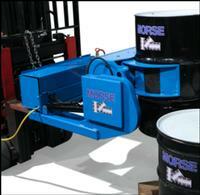 Grab a drum off the floor, from a pallet, racking, trucks, etc. The drum turns down BETWEEN the forks, close to the forklift. 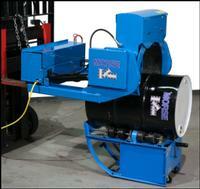 The compact design) provides a tight turning radius. And the GRIP+GO weigh just 680 lbs. for minimal lost load on your equipment. Self-contained 12V battery powers the grip and tilt function, requiring no connection to your lift's power or hydraulics. The battery and charger are included. 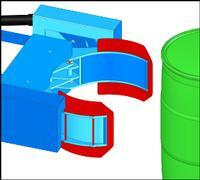 The control pendant has built-in safety features to help prevent unintentional release of a drum. The GRIP+GO requires 25" between the forks, as the fork pockets are 25" apart for clearance around a typical 24" diameter 55-gallon drum. 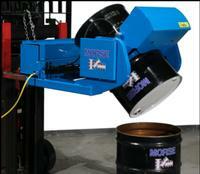 Model MO-290F grips a drum with 8" x 16" jaws. 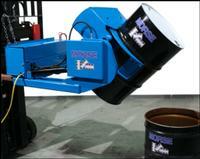 The grip pressure is adjustable for handling steel, plastic or fiber drums.